Monk: An intellectual ventriloquist: that’s an oxymoron. Monk: Well if you don’t know, why did I say it? The puppet must be one of humanity’s oldest and most joyful inventions. The youngest child is delighted by the pretence that a hand or a sock or a doll is a separate being. She can find character in three marks, projecting her humanity onto every available screen. He can believe in the autonomy of a stone and still know that its life comes from the puppet master. Puppets are about relationship – with the operator, with the audience – but we know this relationship is one-sided. The puppet is just a talking stick. Its words come from us. The dialogue enacts our inner conversation and the sweet sadness of our attempts to reach beyond ourselves. 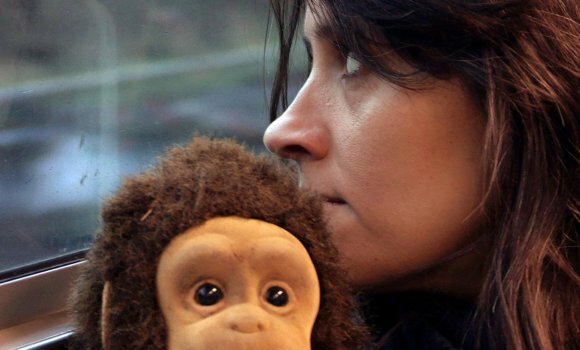 Nina Conti is an actor, comedian and ventriloquist of exceptional gifts, whose performances make particularly rich use of the paradoxical nature of her art. Her self-acknowledged limitations of technique become a way to subvert whilst renewing the ancient interaction of puppet and person. She makes an audience’s simultaneous desire to believe in her puppet’s existence and awareness that it is all an act the very purpose of her art. We want to believe, so much; we almost do, or perhaps we really do in some deep part of ourselves. And yet we know, also, that we are watching a show, a clever, skilful, funny artifice. In that tension thrives art. The tension between reality and illusion—or at least what we believe them to be—is intrinsic to art. It is the door that opens between what we say we know and what we think we know. Art allows us to move between those contrasting perceptions of existence and test them from both sides at the same time. It’s a sophisticated game that is central to art’s power of transgression and its ability to stretch and remake boundaries. The deniability of artistic expression makes it possible to bring into being all sorts of things that cannot otherwise be spoken. Yesterday, Iain Banks died, a much read and much loved author whose books, when they first appeared, were sometimes excoriated for their violence. News bulletins have been replaying interviews in which Banks describes his idyllic childhood and happy disposition – all quite unlike the events in his books. It is art that allows us to look at the things that fascinate, terrify or obsess us safely, knowing that we can always get back through the door if we need to. We all need puppets to speak for us, sometimes. Note: I published an earlier version of this post yesterday, under the title ‘An Ode to Joy’, but took it down because i recognised that I was trying to say two different things at the same time. My apologies to anyone who wasted time trying to untangle yesterday’s confused thinking. I’ll go back to the ode to joy as a separate piece. Thanks – that’s much appreciated. The flashmob film is beautiful. I’ll get back to the earlier post and reshape it into something better as soon as I have a bit of time.